Narrow and hard tips are also suitable for simple nanoindentation experiments with standard AFM parts. Great utility of SCD AFM cantilevers for precise measurements is accompanied by a detailed quality control. After gluing a tip to a lever each cantilever is being observed by SEM before shipment. Thus only good probes reach the customers. 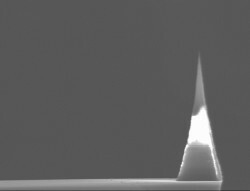 On the image to the left the one may see calibrated SEM images of single crystal diamond tip's end. On the image to the right the one may find topography of so-called "Black silicon" relief obtained by a single crystal diamond probe. This surface consists of Si pyramids created by a special etching. It is characterized by very low reflectivity and is used in solar cells. The main challenge of imaging such pyramides is their extreme height: 6-7 um. Only a very narrow and high tip could get between neighbour pyramides and show detailed topography of such sample. As it may be noticed from the image, our application scientist succeeded to get a high-quality scans with clearly visible side walls and other dimensions. Such image is impossible to get with standard cantilevers of 20-40 degrees cone angle. Tip's cone angle: < 10 degrees. Tip's curvature radius: < 10 nm. NSG30/SCD - for noncontact mode.